done. el fin. the end. peace out, nf. I really hope I got that complicated math right ... I think I did. I used a website meant for elementary school students so ... let's hope real hard that I did. So. Last night was the last night of the float for Simon's third year of residency. Praise all the sanity saving gods. Simon told a real knee slapper this morning when he got home and said, "wow, that month flew by!!" and even Julia couldn't conjure up one of her borderline obnoxious faux laughs .... because .... not funny. Not funny at all. We still have to chug through numerous call weekends and the two remaining night float months of chief year but ... we're getting there. Don't tell me that we aren't unless you have a hankering for a knuckle sandwich. I don't know why I typed knuckle sandwich - my name is Grace Patton not The Fonz. Never again, I promise. I know I'm super obnoxious with my pathetic night float monologues and I appreciate the two of you left in the nosebleed section that are still occasionally reading the blog by the end of these months. I think I took the post down (because it was such a downer even for ME) detailing why exactly night float is so terrible (Simon leaves at 5pm and comes home at 8am or later and the sleeps during the day - REPEAT, repeat, repeat, repeat, AWFUL) but it's just the perfect storm of awful with the no sleep and the solo bedtime routines and the no sleep and the nonsensical paranoia that a predator is going to break and enter and kill me every minute of every hour of every night. But ... we're done for now. I'm not even going to think about potty training Sebastian until he is using complete sentences to beg me to potty train because I learned that lesson with Julia .... you wait until the toddler is ready. Oh ... please don't tell me how much more dificult boys are to train because everyone has told me that and I know. I do. Hence .... the waiting. And I've read enough of exactly one potty training book to know that I hate them all so .... just let me do my parenting thing all wrong here. But tonight he was desperate to wear underwear and he wore me down so I let him and ye of little faith Grace ... guess where I found him a few minutes later? Sitting on the toilet. Triumphant. Oh so very triumphant with a grin and his feet dangling having hurdled the hurdled that is labeled "2" ... if you catch my drift. But there was just one teeeeeny tiny little snag of a detail. In his haste he had sort of forgotten to remove his freshly broken in underwear. So. We'll call it a half victory and pour one out for the soiled Toy Story unders that are having a nice little permanent sleep in the big trashcan outside. And there. Right there ends all the excitement for tonight. Except!! Thank you thank you thank you to anyone that generously cast their vote in the Camp's direction for the Sheenazing awards. You're the best. Every last one of you. I always heard boys were terrible to train, but my wild and crazy Gabriel was 10000000000 times easier than Claire. He was potty trained almost a year before she was so… there's hope! My son was easier than my daughter too- and those teachers at preschool?? They will be your biggest help in the whole process. Outsource that sh..t. Literally. Happy Friday. Happen end of night float!!!!!! I just wanted to give you hope. My son is 4 and my daughter will be 3 in a couple weeks. My son was BY FAR easier to potty train than my daughter has been. Seriously. She has been aw.FULL (2 L's to describe the sheer awfulness). My son literally potty trained himself with 1 tiny accident. So take heart - the legend that boys are harder is not necessarily always the case. Good gawsh woman. Don't even think about potty training (hello, pregnant, one year old, et cetera) until they are close to three! Boy or girl! You are welcome. So is the Rocky theme song playing throughout your house? That is pretty much the song I play when I have survived a week or three or six without my better half. I hope the Pattons go into hibernation mode now, catch up on the zzzz that were lost! And I too can say potty training a boy is not all that bad once you get them to aim! I threw cheerios in the toilet for target practice...worked like a charm! Not true! Boys aren't harder to train. My boys were trained by two. Also taking a little boy who can stand to a public potty is way less gross than taking a girl ;) Just started training Evie (she's almost two and half) and blogged all about it. I say if their interested, go for it! It all depends on the child, not gender. YAY. To both night float and that adorable story about Bash. Won't it be nice when night float can join in that one big permanent sleep? You reminded me that I need to watch Pollyanna! My mom gave us a copy for Christmas this year, and said we should be proud because the aunt's last name is Harrington. I knew I married Chris for something. My three boys were easy to potty train. I just waited until they said they were ready ( all between two and three years). There were a couple accidents, but very few tears. Definitely counts as a half victory. :) And yay for sleep! I always have to have a nightlight on the nights I'm sleeping alone. And then open my eyes every ten seconds to make sure someone isn't hovering over my bed. So I totally feel ya there. 75% congrats! and btw, i LOVE the new blog design! YAY!!! I am so happy for you! I feel like I can tell the relief you are feeling through the computer screen and it is glorious! Enjoy it!!!! Oh Bash. =) I applaud you on your night float survival. 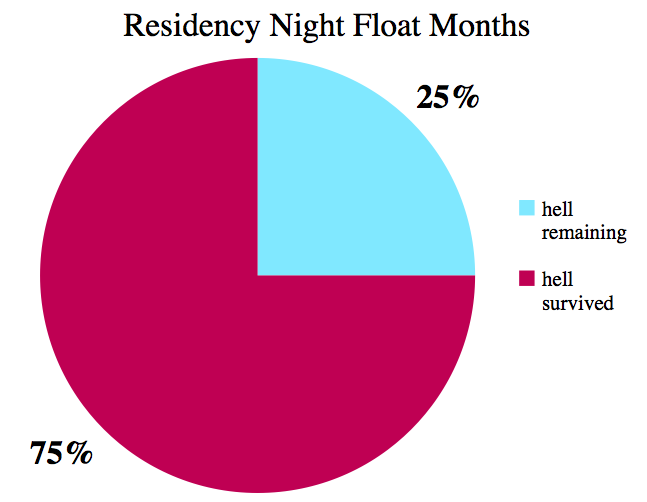 I'm in surgery residency, and night float is hell even when you have nurses to change the diapers and narcotics to make people sleep. I've successfully potty-trained 0 children, so I'm clearly an expert, but a friend's son recently wanted to wear "unnaways". After a few disastrous attempts, they bought the cheapest underwear they could find (like a 50-pack at Costco for $2) and let him wear them with a diaper over top. He was happy with his undies, and they could just toss the underwear in the trash with the diaper. HOORAY! And with the next one, you can at least say to yourself, "This is the second-to-last one . . ."
My husband usually has night court a couple of times a week (as a lawyer, not defendant :-), which is a mere fraction of the hours you have to deal with, but even in those few hours I manage to concoct the most amazingly sordid scenarios of what could happen to me or my children when he's not here. So I have a faint inkling of the terrible, terrible ordeal it must be to be alone all night with that kind of crazy brain. Yuck. I have no experience with potty-training girls - I don't have one (hopefully yet can be added to that statement). I do have two boys and the oldest has bee "trained!" It was seriously super easy my husband and I keep talking about how it went so much better than we ever thought and it's been more than 6 months. I will tell you, we waited until his third birthday which many may consider way too long. However, it took us about a half a day of sitting on the pot every 15 minutes for him to figure it out and he has had not one single accident - not one! He wore pull-ups for naps and bed about two weeks and then I let that money hog go because he was waking up dry every time. It was seriously a dream that I can only chalk up to waiting waiting waiting. It isn't about just desiring to go on the potty, it is being physically ready....at least that's my belief. Now, our younger son who isn't quite 2 wants to sit on the potty and tells me every time he has to poop but I just don't believe him and I refuse to even let him try....I just don't believe a two year old can have no accidents and I would much much much much x100 change a diaper than dirty undies and pants! Woohoo night float be gone!! Easton potty trained way faster than I thought he would after countless stories of how awful it would be to train a mister. But it happened and it's done, we lost a few good pairs to the haste of "do it myself" but ehh what ya gonna do? Here's my experience with potty training boys: Boy #1 announces at exactly 2 years, 8 months "I'd like to wear underwear now". And so he did. That was it. Boy #2 took a little longer and it wasn't his idea but it was not traumatic or prolonged. Boy #3 was the one who I was sure would go to kindergarten in pull ups. What finally clicked with him was allowing him to pee outside. Nothing delights a little boy more than getting the a-ok to pee off of the porch. We encouraged him to poop inside but that didn't always happen. The upside - we had the greenest grass in the neighborhood. Fun potty training story: We were in Panama City Beach with some friends who had kids of the same ages as ours. Other Daddy decides to take our 3 year olds for a walk down the beach so the mommies could sunbathe in peace. He sneaks the kids into a fancy resort with an awesome playground. MY kid decides to poop in the pool... it gets spread down the slide... Other Daddy takes him inside the lobby of the fancy resort to find a bathroom to clean him. Being a Daddy (and not a mommy) he tries to clean the swimsuit before cleaning the kid. Kid finger paints poop all over the bathroom stall. Other Daddy finally bathes kid in the sink, gets his swimsuit clean enough to wear, gets the bathroom cleaned and then goes back to the resort pool to clean the poop off the slide. Kid #3 will be 20 in a month and Other Daddy STILL talks about his trauma that day! SING WITH ME GRACE..." There's a party going on right here...a celebration to last throughout the year...Bring your good times and your laughter too...we're gonna celebrate your party with you...come on now...CELLLLABRATION!!" Woot! Woot! The end of night float hell is celebration worthy indeed! May you sleep and feel at peace once more my friend. PS..Go Bash go!! That is a great start. Ok. I KNOW you don't want to hear this. But I've potty trained 4 boys. If he's willingly sitting on the potty to poop, for the love of all that is holy, DO IT NOW!!!!! Seriously. I waited with some and I did it earlier with others, and earlier is WAY, WAY better. Trust me on this. I've heard that the second child is easier, especially because they have someone else demonstrating what to do. Hope this is the case for you!! I just died laughing. Like five minutes of very attractive cackling out loud. BASHHHHHHH! He kills me. Hip Hip Freakin' Hurrah for night float being 3/4 done! When we checked that off our list it was such a huge weight off our shoulders. 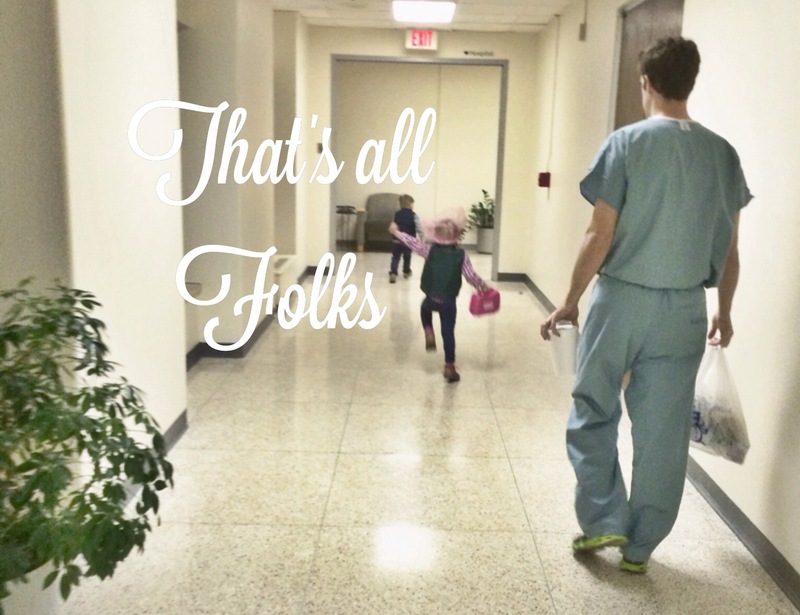 Granted, we still have a few trauma rotations left (24 on, 24 off), but it still felt great. Also, hearing you say Chief Resident is so weird. Didn't our guys just start residency? Ben beginning to look into fellowships and it seems crazy that we are almost to that point. Even crazier that Simon is already interviewing! What places are you guys looking at? Congratulations on the end of night float! Also, our boy was easier to potty train than his two older sisters, so don't give up hope! Congrats on being done with night float! I'm so excited for you! My husband is picking his step 1 date this week (yuck). I'm eager to know what he'll finally pick as his specialty sometime in the next year. And Simon is planning on doing a fellowship right? Do you know if he'll be doing a 1 or 2 year one? Anyways, congrats on the end of night float and being so close to the end of residency!! You made it!! I hope the last 25% feels like a breeze whenever it rolls around. And, even with the hiccup of not taking his undies off, sounds like you're halfway to a good start with Bash getting trained. Things be looking good for you ;) and I love your posts about anything and everything so even if you dedicated a whole post about how you ate an apple for breakfast, you best believe I'm all over that. Congrats! You made it through! As far as the potty training goes, I have potty trained both. The boy was way easier. Also when potty training the #1 thing someone told me that was fantastic with training a little boy....put him on the toilet seat backwards (pretty much spread eagle facing the toilet tank). Sounds rediculous but everything aims into the toilet without help and the kid isn't afraid of falling in. Made a huge difference for us. Messy underwear? Sounds like an already-potty-trained boy, if you ask me. I think you're a hero for making it through a month of night float as a pregnant mom of three. Seriously. My boyfriend is currently rotating through a few weeks of night-shift and my coping mechanisms seem to be 1) talking to my invisible (read:non-existent) cat, Walter, and 2) sleeping with an entire set of golf clubs near the bedroom door. Being alone at night is this worrisome introvert's worst nightmare and I don't even have any children to put to bed. Pour one out... oh man too funny. Seriously. My solution to your predator problem is not a solution. The only way I can sleep when Phil isn't there is with Taylor around. She barks when someone shuts their door in the neighboring house, so I know I won't miss an intruder. However, if you were you get a watch dog, you also have to take care of a dog which I am sure is real high on your to-do list again. All that to say, you have my greatest sympathy. And I hope you get some sleep this month. Catching up on all my reads.